CES is usually a magical time full of wonder and joy where nerds from near and far come together to revel in the new advances in gadgetry and this year was no exception. With the festivities winding down, let’s take a quick look at some of the drone announcements from this year’s event! Without further ado, let’s jump right in and see what 2018 is going to bring us! Ryze Tech came out swinging this year, with a small drone featuring tech from Intel and DJI. If you are looking for a great starter drone for the kids or just want a low-cost drone for yourself, the Tello is a great place to start. At just $99 and 80g, this cheap and light Spark-esqe selfie drone is a great buy for kids or those just getting into drones. Its use of the DJI flight controller provides stable flight and easy to manage controls, and the Intel provided Movidius Myriad 2 VPU provides object recognition and image quality from the 5mp/720p sensor. The partnership with DJI even extends to the Tello being available through the DJI Store when it launches in March. To make this drone even more interesting, anyone can use MIT developed Scratch to program their own functions and flight plans! 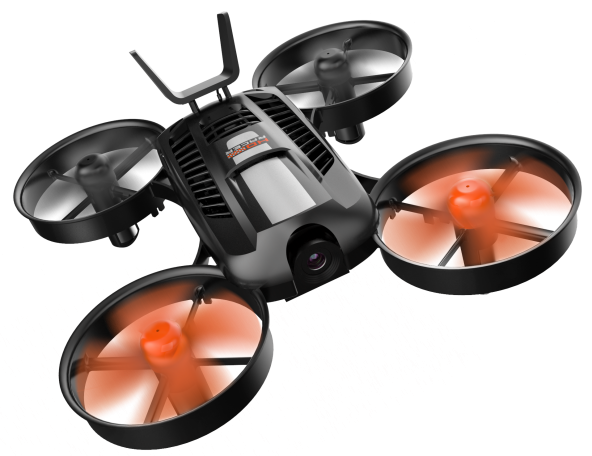 The Tello is ideal for kids just learning to fly drones! Some of you may remember the AirSelfie Kickstarter project from 2016. Well, the drone that fits in your phone case is back with a new model this year and it brings with it an improved 12mp camera, 16GB of onboard storage (expandable with MicroSD), and a charging dock that doubles as a case for your iPhone 6/6+/7/7+, Samsung S7 Edge, or Google Pixel. The AirSelfie 2 will run $300 which is quite a premium for what is essentially a really cool, floating selfie stick. However, if you want to wow your friends with a drone in your phone case, you’ll have your choice of 4 colors when it hits shelves in March. Why buy a drone that can fit in a phone case when you can buy one that is your phone case? AEE Aviation Technology’s Selfly drone breaks down, transformer style to protect your phone when not being used to fulfill your Michael Bay-esque drone selfie dreams. That is of course as long as you have an iPhone 6 (or newer) or a Galaxy S6 (or newer) device. The first deliveries of this 12MP selfie drone are expected next month ifyou pick one up on Indigogo. The current price tag is $109 but the Boston based company said that the units will retail for $139 when they launch later this year. 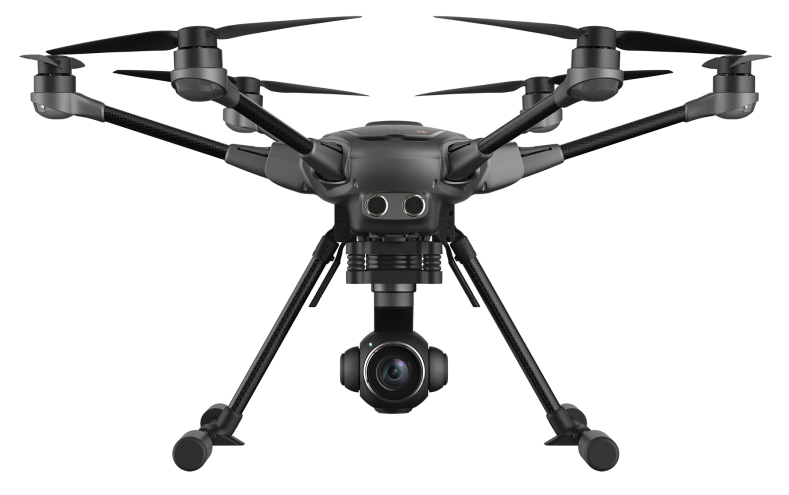 This CES was all about firsts for Yuneec, as they pushed into two new segments and released a welcome update to their Typhoon H series aircraft. the camera to a full 1″ CMOS sensor that shoots 20mp stills or 4K 60fps video. You can also expect improved low light performance along with the larger sensor. Like the earlier Typhoon H, this unit comes with an Android-based controller and built-in 7-inch display. segments. While the cost of $699.99 (when it hits shelves in the first half of 2018) is lower than most quadcopters it would compete with, I still have a hard time determining if this aircraft will take off – pun intended. My main concern with the Firebird is the relatively low (30 min) flight time. 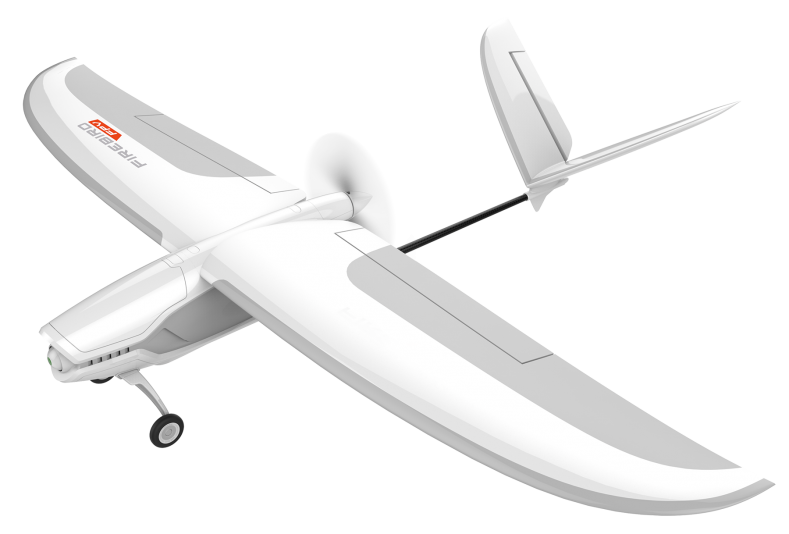 See, fixed-wing drones are less maneuverable, sometimes harder to fly, unable to hover, and need a runway to takeoff and land. However, they usually make up for it by being more efficient than rotor aircraft and thus have a higher speed and longer flight time. That makes them great for mapping or surveying large swaths of land. For example, the Parrot Disco costs $200 less (just $499 on Amazon) and has a 50% endurance bump to provide a full 45 min flight time. All that being said, I’m excited to see Yuneec branching out and look forward to reviewing the Firebird when it becomes available. This is Yuneek’s first attempt at a racing drone, and it’s not that bad. The $179.99 price point brings it in at the lower end of the market which, along with its durable build makes this an ideal drone for those just starting out. The onboard 1080p camera and low-latency video link provide pilots with a live feed when racing. Look for the HD Racer to ship sometime in the second half of 2018. While self-driving cars have received most of the media attention lately, this Intel-powered drone takes it a step further by being “essentially a flying car” that can fly itself. So a self-driving, flying car if you will. 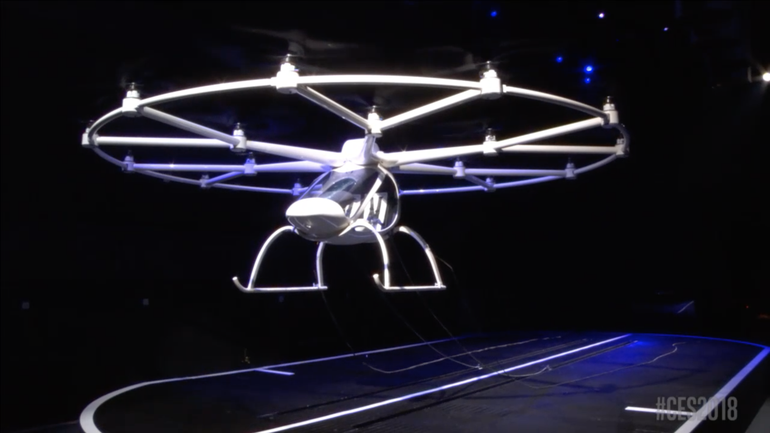 Built by German-based Volocopter (formerly E-volo), this two-passenger VTOL aircraft delighted spectators as its 18 rotors lifted if off the stage inside the Monte Carlo Hotel during Intel’s Keynote address. With a 30min flight duration and range of ~17 miles, the uses for this unmanned transport drone are limited. That being said, Volocopter will have some time to improve the system before the FAA is willing to let it fly in the U.S.
One of Kickstarter’s most infamous failures is back from the grave, sort of. 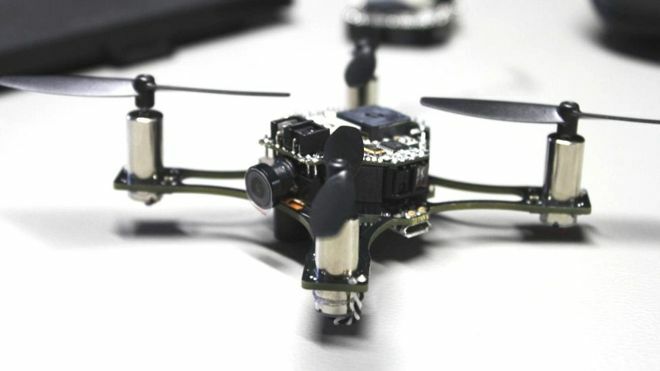 Extreme Fliers, a London-based micro drone manufacturer has purchased the assets of Torquing Group, the failed drone’s creator and will be open sourcing the IP associated with the aircraft. The Zano Camera Project, as it is called, will focus on allowing enthusiasts to work together to upgrade the firmware and unbrick the ~1,00 units already in the wild. Vernon Kerswell, the CEO of Extreme Fliers hopes this not-for-profit endeavor will serve as a testing ground and open source community that may eventually result in future hardware releases.